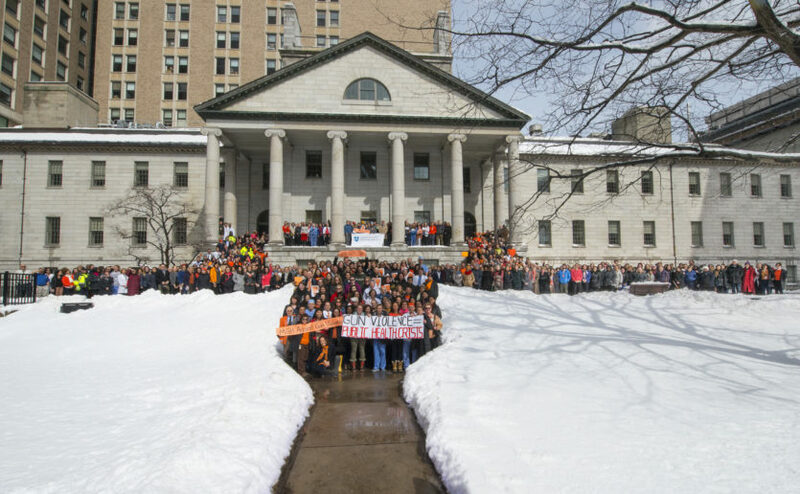 On March 14, 2018, Mass General staffers joined healthcare workers and students nationwide in calling attention to gun violence as a major medical and public health issue. Seed funding for the center is coming from the MGH Fund, and we will be seeking ongoing funds through philanthropy and grants. The names of these cities and towns collectively remind us of the grim reality of gun violence in our nation. Sadly, this list – already far too long – represents only a sliver of the many communities that have suffered the loss of precious lives in mass shootings. Mass shootings, however, which tend to draw the majority of the media attention, represent less than 1 percent of the nearly 40,000 firearm-related deaths reported by the Centers for Disease Control and Prevention in 2017. Suicide accounts for 60 percent of the total deaths by gunshot, homicides are 35 percent, and unintentional shootings are less than 2 percent. In addition, gun violence has a disproportionate impact on communities of color. There is no question that gun violence is a national public health crisis, and as such, the MGH bears a responsibility to help develop innovative and effective ways to address and advance gun violence prevention and firearm safety. I am pleased to let you know that the hospital has recently created the MGH Center for Gun Violence Prevention, a research and educational initiative directed at curbing the problem of gun violence in our nation. Seed funding for the center is coming from the MGH Fund, and we will be seeking ongoing funds through philanthropy and grants. Led by Peter Masiakos, MD, chief of Pediatric Trauma Services, and Chana Sacks, MD, MPH, of the Division of General Internal Medicine, the new center will focus on reducing injuries and deaths related to firearms and promoting safety in the home and in the community through clinical care and education, community engagement, and research. One of the first initiatives involves the creation and launch of a simulation case-based training program for incoming interns, which is slated to begin this June. The center also will build upon the efforts of the MGH Gun Violence Prevention Coalition, formed in 2015, which has brought together a multidisciplinary group of passionate advocates including nurses, administrators, physicians, social workers, physical and occupational therapists, and members of Police and Security. During the past several years, the group has collaborated with many organizations across Massachusetts and New England, including the Massachusetts Office of the Attorney General and the Massachusetts Medical Society to support and encourage clinicians to talk with patients about gun safety. The coalition has also engaged in advocacy and community education efforts, joining last year’s Mother’s Day March to support the Louis D. Brown Peace Institute as well as participating in a discussion during HUBweek about the student-led movement to end gun violence, featuring David Hogg, a survivor of the Marjory Stoneman Douglas High School shooting and founder of the national March for Our Lives. Preventing gun violence in the future would surely be the most fitting way to honor the memory of those who have tragically lost their lives. We have seen the enormous progress that can be achieved when the medical community and the public health community come together to find solutions to challenging health care issues – disease prevention through vaccination, safer motor vehicles, heart disease prevention, smoking cessation. Reducing the number of deaths and injuries from firearms is a critical national public health goal that demands our focused attention and our best collective efforts. Preventing gun violence in the future would surely be the most fitting way to honor the memory of those who have tragically lost their lives. I thank Paul Currier, MD, of the Pulmonary and Critical Care Unit, and Kimberly Smith Sheppard, RN, of the Translational and Clinical Research Centers, who, along with Chana and Peter, co-founded the MGH Gun Violence Prevention Coalition and have been champions of this important issue. Also, thanks to Joan Quinlan, vice president of Community Health, who is providing executive leadership for the center. Peter L. Slavin, MD, is the president of Massachusetts General Hospital.